In this episode, I’ll talk about how your Tarot birth cards hold some clues to who you are. You’ll hear about the outcome of one of my Tarot readings. I’ll talk about the uses for Catnip, and I’m going to give you a prompt, something you can do easily and in a short amount of time, to get some magic into your day. Your birth card can reveal some personal truths about you, even things you don’t want to admit to yourself. I’m going to use myself as the example here, so as not to speak about anyone who doesn’t want to be described in public. You have a strong need to understand and do a lot of research and observation, to learn. You’re on a journey of self-diskovery and contemplation. You question why things are the way they are, knowing that there is a deeper meaning to life, and searching for it. You have a deeper, more spiritual understanding of life, and it gives you different priorities as a result. You’re content with being alone or to associate only with those on your level. The Hermit represents the desire to turn away from a materialistic society to focus on the inner world. You have a need to honor the wisdom within yourself, to find your own light, and create your own path. You’ve learned to help others with compassion and some level of detachment. You’ve gone beyond being critical and can understand and appreciate that people have different paths to their purpose. You’ve reached a level where you no longer need to convince others of what they should do or how they should do it. The other side of the coin is that you’re either not taking enough time for rest and personal reflection, or you’re isolating yourself too much. It can also be that you’re not stopping to think, and get in trouble for not having thought things through first. If you want to find your birth card, you can use this formula. Take your birth date and separate it into single digits. Then add those numbers up to form a new number. For me, that would be 1+4+3+1+9+7+2 which gives the number 27. Since this number has two digits, we add them again and end up with the number 9. This shows that my birth card is the Hermit. You can also calculate two birth cards. Some call these a Personality card and a Soul card. If you want to do that, you stop when you’re down to two digits and write those down, before you continue to one digit. If you only have one digit, then the two cards are the same. My second card would be the Moon. You need to move without a clear picture of where you are going, allow your intuition to guide you. Your dreams, intuition, and inner guidance lead you forward toward higher levels of understanding if you listen carefully. Instinct and intuition are often in control instead of the head. The Moon also speaks of things like magic, mysticism, eccentricity, and creativity. Those who know me would nod their heads. If you want to know what your birth card means, we can talk about that over a cup of tea. You’ll find the link in the show notes. Things tend to go in cycles. You may have hit a creative slump, but you will get out of it. There will come a time when this will ease off and you will be able to focus more on creating and fun. Don’t get diskouraged. But you shouldn’t stand still and wait for better times either. You can work actively towards improving this. There may be some external factors influencing your situation that may be unknown to you or outside of your control. This can feel quite unpredictable and unnerving (especially if you like being in control). Try to accept what is happening and adapt. When you’re being pushed in a new direction, know that every path leads somewhere, even if you don’t know where. Just go with the flow, stay optimistic and keep as upbeat as possible. You’re approaching a pivotal point in your life, where new options become possible. Change is not only likely to happen, it is certain to happen, and soon. You may need to move things in a different direction. Meditation and visualization may bring some further clarity on the matter. You may need to review your goals and think about why you wanted to achieve them. Think about what it will be like once you get there, and re-committ to your objectives and the actions required to make your dreams a reality. You may be finding it difficult to get a specific project or idea off the ground. Each time you try, it seems to amount to nothing, or it takes you even further away from where you want to be. You may be losing faith in your talents and abilities. If this is the case, relax, lighten up and give yourself some space and ‘down time’. Take a holiday or a break from your usual routine, and you will find that this helps you to re-energize and re-focus. Are you eating well, sleeping well, playing and working enough, getting enough exercise? Balance your work and the rest of your life, so you don’t burn yourself out. Take the middle road, avoiding extremes and stay calm. You may feel that you can’t get opposites to “blend” together (choices, belief systems, families, friends, passions) and you believe that you have to give something up to get your business off the ground. You don’t have to do that.You can combine them if you’re willing to keep on trying, experimenting, and adjusting the amounts. Mixing your talents is something that may also help. You have to be patient (although I know how hard that can be). Don’t rush things, take your time, and do the best you can. When the moon more dark than light and has a crescent shape, a few days before the dark Moon, it’s called a Waning Crescent. The decreasing powers of the waning phase are at their strongest in this part of the phase. You can continue the work you started when the Moon started its waning phase. It’s a good time to focus on removing yourself from situations, relationships, and habits. You can do waning, repelling, decreasing, or reversing spells. Rituals that require more energy for banishment but not quite the raw power of the dark moon are best performed during this time. This is a time to pay attention to anything that you have been procrastinating about. It’s a good time to rid yourself of anything that’s an obstacle, to get rid of things you know longer need. To cut your hair, if you want it to grow out slower, for weeding and hair removal. It’s a time for self-analysis, rest and recuperation, meditation and getting ready for the dark Moon. 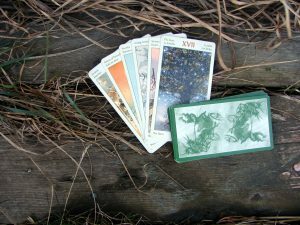 Today’s prompt: Find your birth cards and look up what they mean. You’ll find my old interpretations in the Witch’s Library, but I’m working on getting my new, better-flowing texts up there. If you want longer descriptions, a good place to look them up is Biddy Tarot, which is linked in the Show Notes. Don’t take the whole interpretation, but look for the things that resonate on some level. That’s it for me for today. Thanks for listening to the Witch in the Valley Podcast. The next episode will, among other things, be about gardening by the Moon. If you have any questions, just reach out to me at linda@lindaursin.net Remember to rate and subscribe to the podcast on iTunes.